Bayer Leverkusen v Bayern produced a big surprise in the Bundesliga title race. Leverkusen one goal down after 45 minutes turned the game on its head to beat champions Bayern 3-1. The game had its first controversy within the first two minutes of kick-off. Karim Bellarabi was given too much space on the edge of the penalty box but his shot was deflected off Mats Hummels’ arm, and to the surprise of Bayer players and fans the referee team decided against a penalty. It was breathless end to end stuff at the opening stage of the game. Leverkusen took the game to Bayern, which in turn gave Bayern room to counter. Both teams had chances, Julian Brandt for Bayer Leverkusen in the 10′, Kingsley Coman (12′), Robert Lewandowski (15′) and Leon Goretzka (25′) for Bayern. Leverkusen may have been the team pressing, but Bayern used the space well to create the majority of the chances. 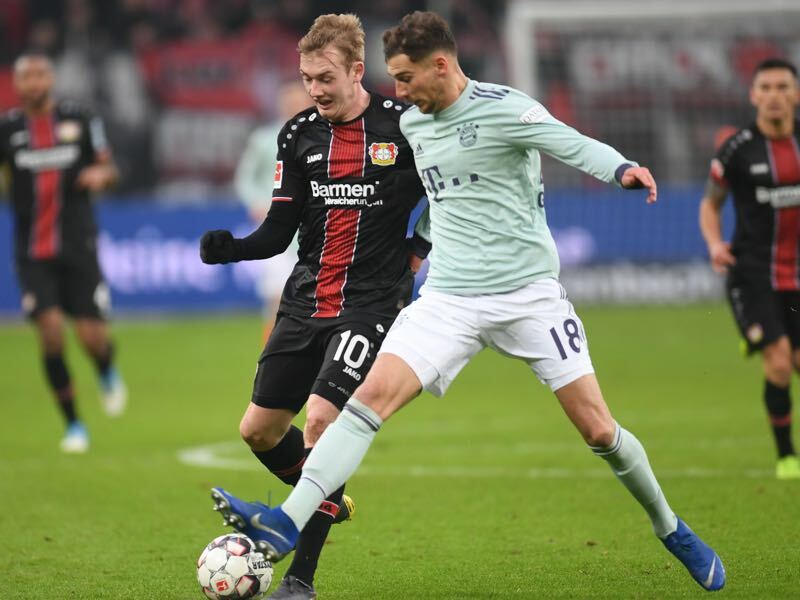 At around the 30-minute mark, the game developed a nasty edge, which was due to a real urgency of both sides to press for the opening goal, which arrived in the 40′ minute courtesy of Goretzka. Mats Hummels opened up the play from the back with a great pass to Coman, the Frenchman sprinted forward saw his shot stopped by Lukas Hradecky, however. Müller jumped on the rebound and sent the ball back into the box where Goretzka headed the ball home from close distance. 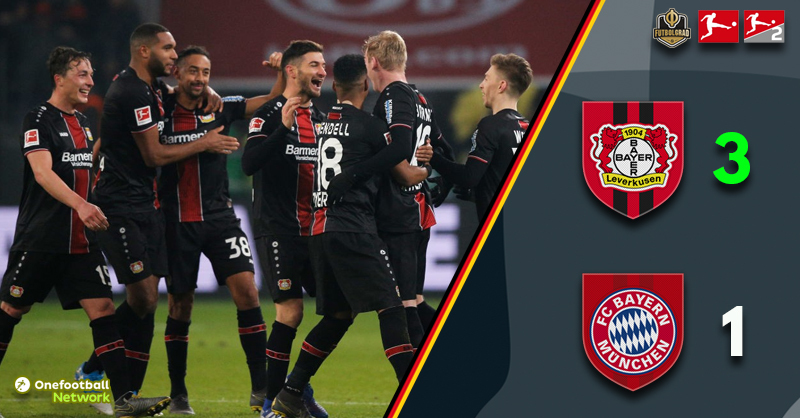 Shortly after, Bayer Leverkusen lost Kai Havertz to an injury rounding up what was a frustrating first half for Leverkusen that could have been even worse had Lewandowski goal not been called off after a lengthy VAR review just before halftime. Bayer was left off the hook and in the 52′ minute equalised. Kevin Volland was brought down outside the box, and Bailey curled the ball over the wall for a fantastic goal to make it 1-1. The goal changed the complexity of the game. Leverkusen now turned on the pressure, and Brandt saw a shot stopped in the 60′ minute after Leverkusen had laid siege to Bayern’s penalty box. Not that it mattered much because two minutes later Leverkusen had turned the game around. Mitchell Weiser played the ball to the right to Bellarabi, he then broke into the box and centred the ball where Volland tapped the ball past Bayern keeper Sven Ulreich to make it 2-1 in the 62′ minute. How would Bayern react? The Bavarians had their biggest chance to equalise in the 73′ minute, Lewandowski crossed the ball to the centre where Weiser blocked James header at the last moment. Lewandowski was then involved in the 76′ minute after he got on the end of a James freekick, but his header was just off target. Bayern head coach Niko Kovac reacted by adding more speed to his side by bringing on Serge Gnabry for Thomas Müller and Alphonso Davies for James. But instead, Bayer Leverkusen sealed it but before they got to celebrate the referee team took a lengthy VAR review to check. Bellarabi had sent Brandt into the Bayern half — it was that pass that was reviewed for offside — the winger then broken away and then sprinting into the box spotted Lucas Alario, who easily tapped the ball across the line in the 89′ minute. The goal broke Bayern’s back, as Leverkusen now easily saw the match out. Based on the second half this was a deserved win for Leverkusen. As for Bayern? The best news that afternoon was that Borussia Dortmund dropped two points against Eintracht Frankfurt. Julian Brandt was excellent. Playing as a number eight behind the attacking three Brandt completed 88.7% of his passes, won six of his seven duels, all three of his dribble attempts and played three key passes. His breakaway in the 89′ minute ultimately led to him setting up Lucas Alario for the goal that broke Bayern’s back. Bayern once again fall to a team that played a high press physical game. For the first 45 minutes Bayern were dominant, but as the game progressed into the second half, the Bavarians run out of steam and once Leverkusen had it turned around were unable to switch into a higher gear to turn things around themselves. Bayern’s fourth defeat of the season is as many as they had in the entire 2017/18 season. Leon Bailey has scored with Leverkusen’s first shot on target and for the first time since September 1, in the Bundesliga. Bayern have never won the title when trailing by seven points, or more, at this stage of the season.